I am the first to encourage my kiddos to make joyful messes, and I am usually pretty mellow about it. Children learn through mud, paint, creating their own recipes, crafting, and getting scraps of paper and toys everywhere—I really believe that. However, this was unexpected, we were due to leave the house, and I stayed up WAY too late making headway shopping online for the kiddos’ Christmas gifts this year. These pictures don’t show the half of it. I cleaned up a bit of it, and then just left the rest for when we got home. Now I am home and on my computer. At least the floors will smell nice… I should probably get to it. 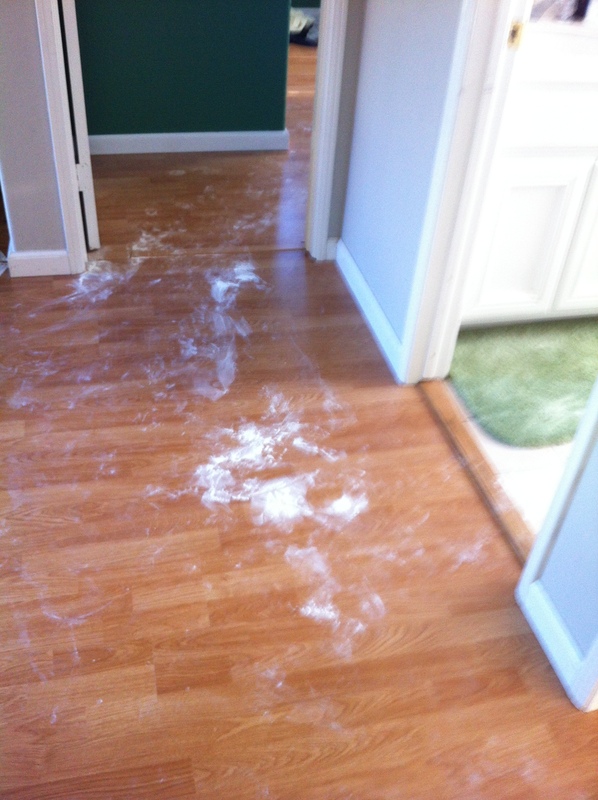 The good thing is, the strewn powder doesn’t seem nearly as much of a mess as it did before the party. Sometimes it is good to give myself a time out. Looking back, it was silly to be stressed by this, huh? It’s just that I’ve been trying to get the house somewhat in order before we put our decorations up in a couple of weeks. Oh well. That’s just part of life with the young set! Eric is making a silly face on purpose! Pirate Eric! When I saw this one, I cracked up because I used to make a pirate smile in virtually all of my pictures when I was about Eric’s age. He must get this from me! Ready for the birthday party (Eric wanted to run around the yard at this time). We are having trouble with our grass this season (and have tried various solutions), but I think the brown gives the picture a certain fall ambiance, don’t you? Our birthday present for Gracie, who turned two-years-old today and had a “Curious George” themed birthday party. The kiddos and I made a monkey card this morning! The birthday girl and her mama, Lauren, who is pregnant with their third—their first boy! Lauren’s mom Sharon made this Curious George themed cake and cupcakes—so adorable! Eric loved his little party blower! The truth is, I find my son hilarious. He makes me laugh constantly, my little jokester. I don’t know if you can see it, but he put the rest of his cupcake on the back of the bike and started biking away with it. Cupcake ride! He has this unique way of looking at the world that fills me with mirth. Yesterday was Katie’s last soccer game of the season, and my first red cup of the season! We had an 8:00 AM game. Oh I am going to miss soccer with my little people. It was my special time with Katie, watching her practice, taking her to pick out gear, cheering her on…and it was special time with Eric, together playing on the sidelines during evening practices. Grass fights. Follow the leader. Wrestling. Kanga and Roo. His construction trucks. Boy am I going to miss those Wednesday evenings with my kiddos. I know we’ll be at home together, but those have been very special times for us. Sigh. So glad she initiated playing spring season!! Katie is ready to kick off. Early to the game and before warm-up. We made oobleck, which is a non-Newtonian substance made of corn starch and water that can act like both a liquid and a solid based on the amount of force exerted on it at any one moment. We use a 1 : 2 (water to cornstarch) ratio with a few drops of food coloring for panache. 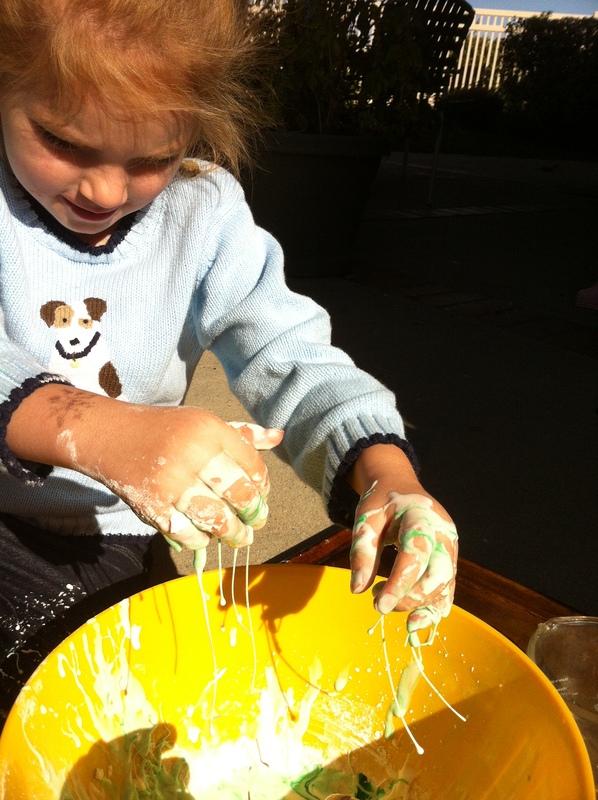 Oobleck is gnarly good fun, and on a list of winners for us. Even after our experiment was winding up and the oobleck was drying out, Katie took it back inside, adjusted the water ratios without any input or advice from me, made it work again, and then entertained herself with it for a loooooooooong time. Rainy day? Oobleck is going into our bag of tricks! When you pick it up, oobleck feels like a solid. When you let it go, or when it is sitting in the bowl, it looks and acts like a liquid. The best part of all this (besides the ooey gooey lovely messy fun) was that it tied together our studies of maize with our studies on states of matter from a couple of weeks ago. It felt like so much of our learning came together right here. I love that! We also tried out my new pumpkin scroll Williams-Sonoma loaf pan and a new recipe for pumpkin bread that came with it. I actually have some pumpkin bread gifting that I’d like to do, but I wanted to test this new recipe first (I usually use the Joy of Cooking). I liked the orange zest in it, but I did miss the more clove-y notes. The kiddos preferred the JoC recipe, though I liked some of the nuances of the W-S recipe. And then, this was really neat. Working totally on her own, Katie decided to make clothes for her cornhusk dolls. I did not help or have one bit of input. She cut them all herself and attached them. What really made me jazzed: she made a white pilgrim bonnet for her doll, bringing together our study of corn with other seasonal history we have been studying. Hurrah for synthesis! I just love it when those assessments of what she knows can happen (or even reveal themselves) on such an authentic and truly internalized level. Children reveal so much of themselves and what they know in their play. What a privilege to be her teacher and her mom and to get to see this happening. Hmm… 5:04 PM now. 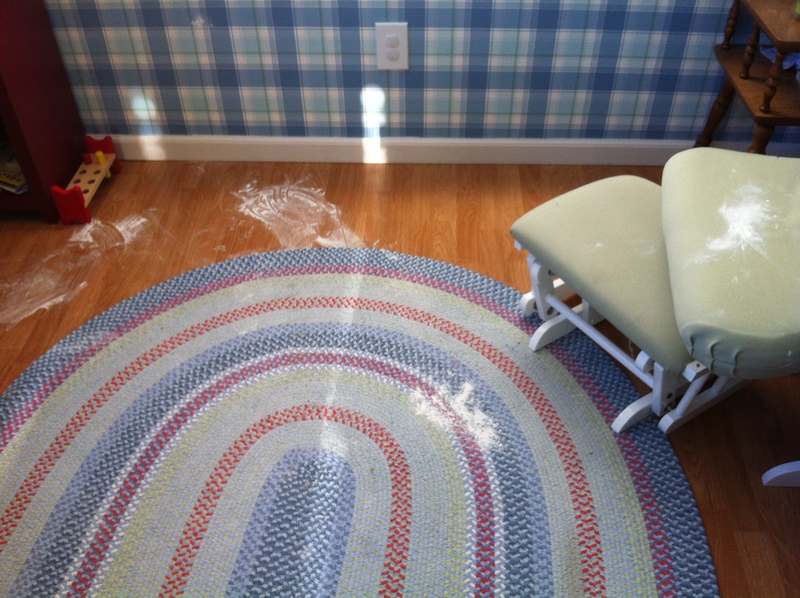 Bill has the kiddos downstairs, so I have a bit of time to write…and clean up powder. It’s time! The funniest thing of all is that baby powder is cornstarch. The irony of the connection to our maize unit is not lost on me, believe me! When we live our learning here at the McGaugh Academy, we really live it!